This is the story of a man who dug himself into a hole and it wasn't before long that he realised that he couldn't get out. Then came this brilliant idea (or so he thought) that if he continue to dig deeper, he will eventually hit water. And hoping when the water starts coming out, it would eventually start filling the hole that he dug and thus be able to float up to the opening of the hole and climb out. 1) He never hit water. 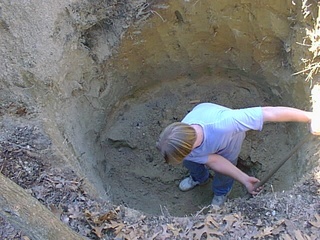 2) He got in so deep that the earth that he dug up no longer able to be tossed out of the hole. The earth, at best, were feebly thrown against the wall of the hole only to have them fall back in. In short, whatever earth he dug up, stayed inside the hole. Moral Of The Story: If you brought in a diarrhoeic farting elephant by mistake, get out of the house right away. Fanning furiously trying to CLEAR THE AIR, not only is futile, it also makes you look stupid. Ahtiong73: Let's see how this pan out, shall we?